If you will not be showing rabbits, or care what breed your rabbit is or will be, stay away from this book. There is very little on the care and maintenance of your bunny friend. Johnson even went as far as to recommend rabbits as good starter pets for kids. That is far from the truth. While they are cute, fluffy, and rarely bite, they are very fragile and can be temperamental (like mine). Rabbits get easily frightened and will scratch and flail to get away, and bite if angry enough. They aren't normal pets, they are prey (more than that, they are at the very bottom of the food chain), while most other pets are predators (cats, dogs...) and therefore need to be approach differently. There was hardly any explanation of behaviors, suggestions for rabbit-proofing their play area, illnesses, or properly handling of your rabbit. Stating that the reason why picking your rabbit up by the scruff is not preferred because it can loosen the fur making it less desirable in shows is not really why it isn't preferred. Picking it up in that fashion can leave your rabbit feeling scared, and can overextend itself injuring its spine trying to kick to escape. Anyway-If you want a picture guide for spotting rabbits, much like bird watching, then this is the book for you. Otherwise, find another book. I have never owned a rabbit and I probably never will. However, I picked this book up at the library because I needed some feel-good cuteness. 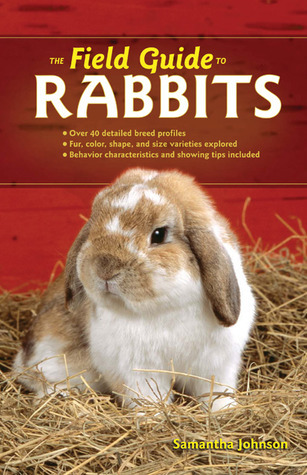 I sure the book has useful tips for those looking to raise/show/own rabbits, but I was far too busy saying "aww" over the pictures to really pay too much attention. It was ok. A basic starter rabbit knowledge book. Samantha Johnson - SAMANTHA JOHNSON writes about the happy things in life—pets, home, family, food, and gardening—and thinks Mondays are the most wonderful day of the week. She fills her rare spare moments by crafting to-do lists and fulfilling the commands and demands of her bossy Corgi. She's the author or co-author of ten books, including The Rabbit Book, The Field Guide to Rabbits, The Beginner's Guide to Beekeeping, and The Beginner's Guide to Vegetable Gardening. Contact Samantha at [email protected] .